The day starts with a pick up from your hotel by coach transfer to Beaufort Railway Station. The Padas River is located deep within the woodlands of the Borneo continent, so pack up with ample supplies and provisions. You will arrive at Beaufort Railway Station. Proceed to board the train and make yourself comfortable. The train is scheduled to depart at 0750 hours, in which you head to your next stop, Pangi Station. Pangi Station will also be the starting point of your adventure, and the entire journey takes approximately 1 ½ hours to 2 hours. Enjoy the panoramic views from your seats and enjoy the gripping sensations of the train at break-neck speeds. 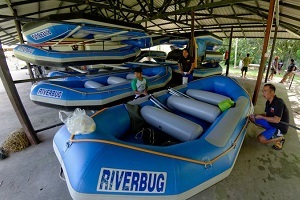 You will be given 10 minutes stop along the way at Rayoh station, where you can safekeep your belongings and get a quick change of rafting gears. 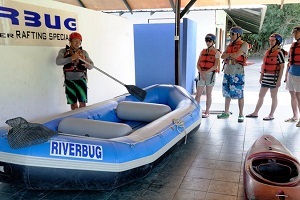 Upon arrival at Pangi station, you then proceed to listen to a safety briefing by the River guide on the important notices, demonstration of the equipment used as well as the levels of currents of the rapids to be cautioned for. 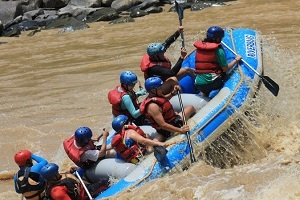 The rafting begins here and ends at the Rayoh Station, a total of 10km across the various rapid points. The entire stretch will take approximately 1 ½ to 2 hours. 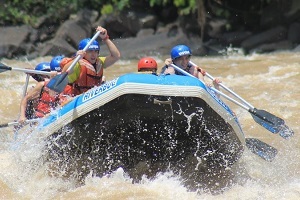 Feel your blood boil with excitement as you take the rapids head on and thrill of the icy waters. 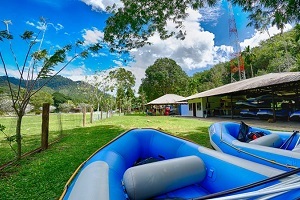 You arrive at Rayoh, the ending point for the rafting adventure. Proceed to change into dry clothes and indulge in a warm, delectable lunch of local cuisine. After lunch, you head back to Beaufort by train at approximately 1330 hours, which is an estimated 2 – 2 ½ hours train ride. You arrive at Beaufort Town. An arranged coach or van transfer will take you safely back to your respective hotels in Kota Kinabalu city, which is another estimated 2 hours – 2 ½ hours. You arrive in Kota Kinabalu for a good rest. 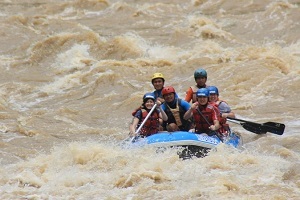 2 ways transfer between KK city hotel and Padas River. Items not stated in “includes” section.